A bunch of us hangies joined in on the paragliding community's friendly pre-season comp, Gatskop, at Porterville. After a poor flight on Saturday, I had a nice flight on Sunday. I had a good launch, but for some reason, after 300 flights in my harness, I grabbed my drogue chute pocket (where I keep my energy bar) by mistake instead of my zipper cord and unwittingly jettisoned my energy bar 30 seconds into the flight. Yet another good reason not to fly with a drogue chute! I then reached for my zipper cord and pulled it a little too hard and it snapped, leaving me unzipped and unable to fix it. A great start to the flight! Eric had launched immediately after me, and so after quietly mourning the loss of my energy bar and my unzipped state, I hooked up with him north of launch and we climbed out together. We were often wingtip to wingtip, with first one finding the better core and getting above, then the other. Eric got up higher and led out on the first glide. I followed and we joined each other in the next thermal, but got separated as we climbed. I found a better core and topped out first and went on glide. Eric followed below me, but missed the next climb and sadly was soon on the ground. It was that kind of day. I managed to stay in the air and got to Bumpy Peak, the last peak before an area of difficult retrieve, where I got stuck for ages as I was unwilling to press on low. Instead I enjoyed soaring the face of Bumpy while I watched 3 PGs catch and pass me in out in the Valley. Finally, I got up enough to feel comfortable pressing on. As it was, I still had to make a low save over the farmhouse in order to get up and out of retrieve trouble and to the Piekenierskloof Pass. At the Pass, I faffed around again until I found a thermal over the cow paddocks that smelt strongly of manure. 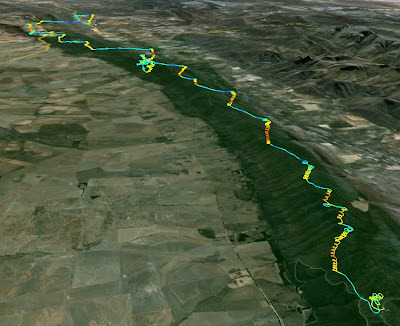 Circling in the smelly air, I was able to get up and over the back into the Citrusdal valley. From there I drifted along the N7 before running out of lift and landing 46 kms out from Dasklip. I was in the air for 2h45. 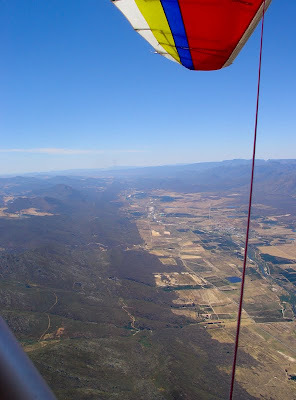 A really long time for 46kms, but it was wonderful to be in the air and get some early season practice.